Bencollaghduff (Irish: Binn Dubh, meaning "Black mountain"  ) is a mountain in Galway, Ireland. With a height of 696 metres it is the third highest mountain in the Twelve Bens after Benbaun and Bencorr. The Bencollaghduff is located along the ridge which connects Bencorr (SE) and Benbaun (NW). It can be reached by a long rocky slope; a cairn stands on its summit. The mountain, along with Twelve Bens range, is part of the Connemara National Park. The Irish novelist Joseph O'Connor in his awards winner novel Star of the Sea cites the quarzite shale on the slopes of Bencollaghduff. ^ a b "Twelve Bens Area". MountainViews. 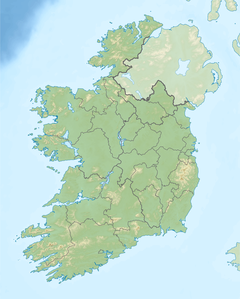 Ordnance Survey Ireland. Retrieved February 10, 2015. ^ "Bencollaghduff, Ireland". www.peakbagger.com. Retrieved February 10, 2015. ^ a b Paddy Dillon (2013). The Mountains of Ireland: A Guide to Walking the Summits. Cicerone Press Limited. Retrieved February 10, 2015. This page was last edited on 29 March 2019, at 11:39 (UTC).